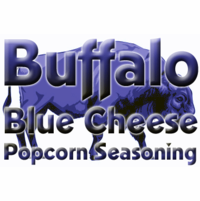 Spicy buffalo wing sauce and mild blue cheese together in a powdered form perfect for sprinkling onto popcorn, pork rinds, French fries, chicken tenders, popcorn shrimp, tater tots, roasted potatoes, and more! Ingredients: buffalo wing sauce powder [A Dehydrated Blend of FRANK’S RedHot Buffalo Wing Sauce (Distilled Vinegar, Aged Cayenne Red Peppers, Salt, Water, Canola Oil, Paprika, Xanthan Gum, Natural Butter Type Flavor, and Garlic Powder), Maltodextrin, Rosemary Extract (as a preservative), and Silicon Dioxide], blue cheese powder [dehydrated blend of blue & cheddar cheeses (pasteurized milk, cheese culture, salt, enzymes), whey, sodium phosphate, salt, lactic acid], onion, garlic, spices. Contains milk. Packaged in a facility that also packages wheat, milk, soy, egg, peanuts, and tree nuts.